Injection Molded Plastic Letters are very high quality plastic sign letters which are Guaranteed not to fade or break - for LIFE! These plastic sign letters are available in pigmented white and black, and any of our Standard colors will be painted (at NO extra cost) and carry the same guarantee. 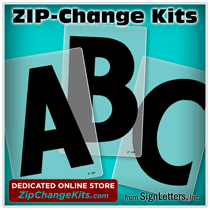 These are inexpensive plastic letters, but they are not the cheap plastic letters you may see others offering. Injection molding these sign letters creates sharp, clean edges; precise, uniform consistency; and greater thickness for a very stable, sturdy sign letter. Injection molded MINNESOTA Letters are based on an all-natural plastic called Cellulose Acetate Butyrate (CAB), derived from cotton and wood fibers making it stronger and more durable than acrylic.